Hyvinkää Falcons is an amateur American Football team located in the city of Hyvinkää. All interested players are welcomed to join from any city in Finland and any country around the world. Over the years Hyvinkää Falcons have been a home to hundreds of players both home and away with the passion for the sport and endless team spirit. New players are always welcomed to tryout and hopefully continue playing American Football as long as they desire. Assistance will be offered at any point from the administrative staff, coaches are fellow players. Do feel free to ask whenever help or information is needed. It is important to note at this point that it does not matter if you have been involved in other sports or this will be your first sport. Trainings are always tailored to gently introduce you into the world of sport both mentally and physically. Your passion to do sport is more important than your prior skills. Also it does not matter at what point you decide to join the team, either during the pre-season trainings, during the season training and tournaments or after the season. Your are always welcome to embrace the sport and gradually learn what it is all about. 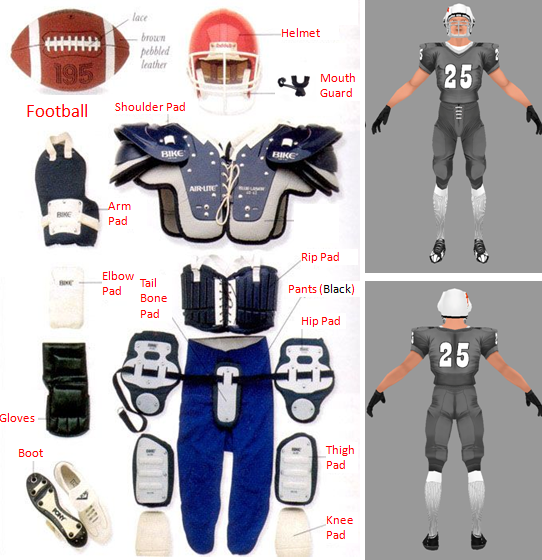 As an American Football player, there are skill and vocabularies to be learnt, how to play as a team as it very team oriented sport but most important how to get ready for the game either practices or tournaments. The diagram below shows the list of gears needed for the sport. For tryout purposes, the essential gears can be obtained from Falcons by contacting your group coach or team manager before the training day. Gears can also be rented from the organization during season tournaments. To obtain personal gears, you can visit local shops. Take a look at http://en.falcons.fi/shop/ for more information on where to find gears. More detailed explanation on what type of gear to purchase can be ask from staffs and fellow players. It is good to be aware that there are more information contact point for Falcons and individual groups. For example, player are to register at myclub.fi which is a portal that helps in managing individual clubs are player involved in more than one club. Individual groups can have other information sharing links and apps such as whatsapp, teamapp and facebookgroups. Details of the currently used information sharing portal can be asked from the group coached and group managers. To learn more about your new sport team, browse through our web pages. Take particular note of http://en.falcons.fi/falcons/ (team history) and http://en.falcons.fi/faq/ (frequently asked questions). Hopefully you like the sport and want to commit to the team for the seasons ahead. There are still more formalities to be aware of, such as gears that must be obtained personally, season fee collectable by Falcons organization, before permitted to partake in any tournament game, playing license to be obtained (procedures for obtaining the license will also be explained) and other specific information about the position and rules of the games. This information can ofcourse be asked from Falcons management and game rules from coaching staff. Worthy of note is the governing body for American Football in Finland (SAJL). We recommend that you learn more about the sport online which include visiting the SAJL organizational pages http://www.sajl.fi/ and other America Football related media.